The image of this week is a detail of a larger painting in which the yellow sand plain stretches out further behind, to the left and right of the thin man (Christ), silent and empty. In the original painting the white robe of Christ extends further down. Standing in front of the work, one is taken up into the vast space. Christ is standing close to the viewer, but is not paying attention to them. His face is without expression, his eyes do not look but are turned inwards. His cheeks are sunken and he has not shaved himself for a number of days. Is he spaced out for want of sleep and food? While his face has personal traits, his hair is in accordance with the visual conventions for portraying Christ. It is auburn, straight, with a parting in the middle, while the lock on his forehead and the length in the neck deviate from the rule. It is clear that we are to recognize this man right away as Jesus, though some of his traits are personal and in line with the time he lived in. As real and human as his face is, so unreal is his ivory robe. It is as if there is no body underneath it, comparable to medieval angels who were also theologically bodiless. Scripture does not mention the colour of Jesus’ garments when he was tempted three times by the devil in the desert, but the artist of this work has his ideas about it: the white gown must be his baptismal and resurrection robe. The way Jesus stands in the empty space reminds us of the lonely desert fathers at the beginning of church history, who are said to have hallucinated due to lack of sleep and food. With this Jesus we become outsiders. He shuts us out. In the strict sense of the word he is busy to ‘reculer pour mieux sauter’ (to withdraw to better fulfil his calling). The temptations in the desert are the beginning of Jesus’ public life. The road to that life is clear only when in the silence of the wilderness he will first have exposed the powers of evil. Not only the bodiless white robe is remarkable, but also the difference between both big hands: one bloodless and one alive. With the dead hand he seems to receive, while he keeps the other one turned towards himself as if he wants to preserve something. Are we pushing it too far when we link this to the cross and resurrection? 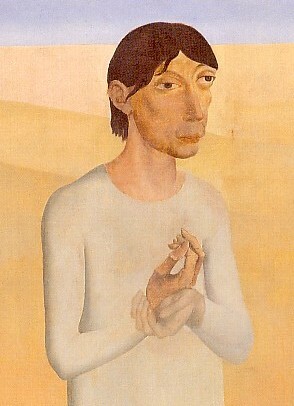 Gustave Van de Woestijne (1881-1947): Christ in the Desert, 1939, detail, oil paint on panel, 122.5 x 169 cm, Ghent, Museum voor Schone Kunsten. Dr. Anne Marijke Spijkerboer writes about art and theology (Wij hebben ongelofelijke dingen gezien, Meinema 2004; Rembrandts engel, Skandalon 2006) and is a minister in Rijswijk ZH, The Netherlands. This meditation can be found (in Dutch) on www.naardensebijbel.nl/column/26/uitgemergeld.html. For more information about Gustave van de Woestijne, go to www.xs4all.nl/~androom/biography/p017396.htm.